Elgato today announced the launch of two new HomeKit-enabled accessories, the Eve Aqua and the Eve Flare. The Eve Aqua is a HomeKit-enabled smart water controller, timer, and usage meter that's designed to control your sprinklers. With Eve Aqua, you can control your sprinklers or other irrigation system using the Eve app, the Home app, or Siri voice commands. There is an auto shutoff feature so you can enable the Eve Aqua via a voice command and then trust it to shut off after a period of time. Like other Eve products, the Eve Aqua connects to a HomeKit setup using Bluetooth. 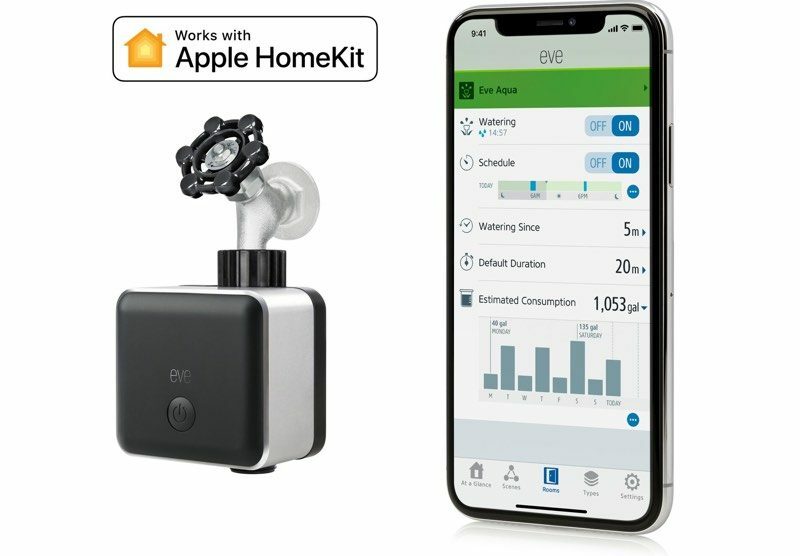 Using HomeKit timers and automations, you can create autonomous schedules for your sprinkler system with the Eve app, and if you have an iPad, Apple TV, or HomePod as a home hub you can control your outdoor irrigation while away from home. In addition to offering control over your water system, the Eve Aqua is able to track water consumption based on an irrigation system's flow rate, with the information visible in the Eve app. 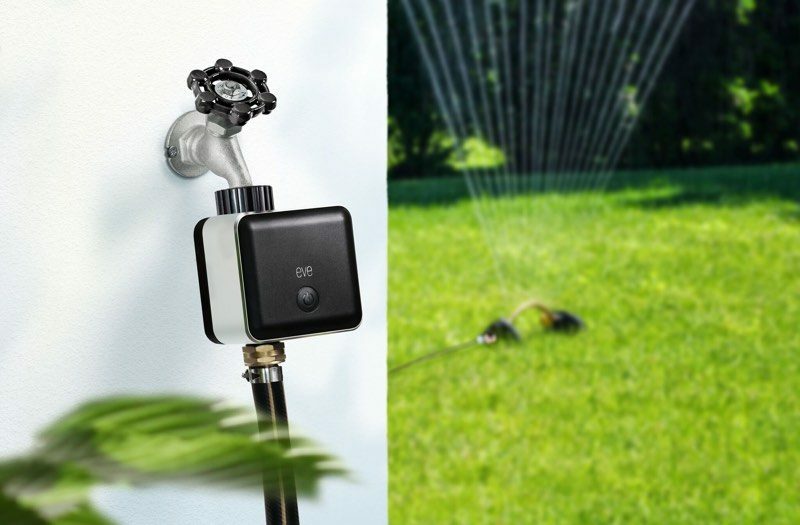 The Eve Aqua is UV and water resistant and can be left connected up to your irrigation system all the time. Elgato's new Eve Aqua is priced at $99.95 and can be pre-ordered from the Elgato website in the United States starting today. Along with the Eve Aqua, Elgato is also debuting the Eve Flare, a HomeKit-enabled portable LED lamp that's available exclusively in Europe. 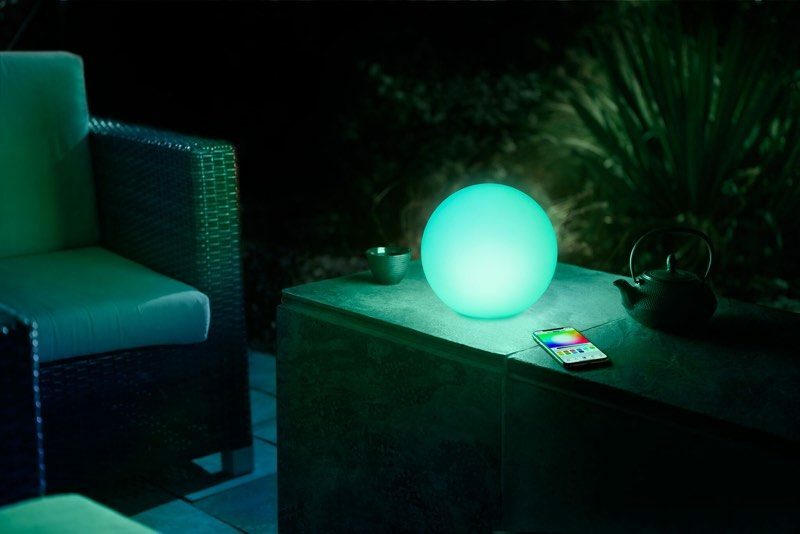 The Bluetooth-enabled Eve Flare is a round multi-colored indoor/outdoor lamp that's water resistant and able to offer six hours of illumination. It charges wirelessly and features a carry and hang handle. Like other HomeKit-enabled lamps, it can be controlled through Siri voice commands or through the Home app, and it can be set to any color of the rainbow. Elgato is making the Eve Flare available for pre-order in Europe starting today for 99 euros. What sort of house needs the foundation watered? That's a new one for me. Ones in Texas built on a clay/soil mix :) Ugly shifting and internal/external cracks will result from houses on dry soil common here in the summer. Technically we use drip irrigation to water the soil about 12" from the foundation, but everyone refers to it as "watering the foundation". I'm pretty sure I'd like this Eve Aqua. Ironic timing, as my current (very old school battery powered water timer) decided to die this weekend. I'd use it to control the watering system that keeps my house foundation watered. Sprinkler system is controlled well via Rachio gen 2. Yes, I had a hose timer for $30 that just broke. It was a purely manual process to deal with rain delays, checking to see if it was “on”(like I’d often not know for a week when the batteries had died), etc. I’ll pay the extra $60-$70 to get something a bit more sophisticated and simplifies my life just a bit. Could you go back to a manual sprinkler controller after using a Rachio for a while? Maybe it will stink. Buy for $100, I’ll give it a try and report back. In the interests of science, by all means! I've seen net capable hose timers for around $50. Maybe not HomeKit, but they can be controlled remotely. What would be really cool is if the Aqua recharged its battery via the force of the water spinning a turbine. Probably wouldn’t generate enough power though. It would be cool! That's how those urinal sensors work, by using the moving water to recharge the battery powering the motion sensor. I’d buy the Eve Aqua if I didn’t need three of them. I really need to figure out a better system at some point.